First off, has anyone seen this yet? Out today! I got the sneak peek a few weeks ago and can’t deny that this was a breath of fresh, corrupted air in the midst of the Oscar run. A sneaky submission into the most popular film days at the theatre, I almost cashed out because it wasn’t on the nominee list. But let me just tell you guys, it was so worth seeing. 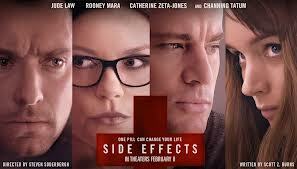 Rooney Mara (a new fave of mine), Jude Law (classic), Channing Tatum (don’t get excited, he’s not in it THAT much) and Catherine Zeta-Jones (random) play a curious foursome illustrating some dangerous potential in the anti-depressant world. Does that make it “The Mask of Zorro takes down The Girl With the Dragon Tattoo (with a striptease and Mr. Ripley)?” No, (but that makes me laugh to really think out). Actually, it provides a brilliant, inter-looping story of whodunit, how and with what along a basic storyline of a young, newlywed girl who suffers from deep depression, recurring as a result of her fresh-out-of-prison husband who has no real plan for the rest of their lives. Law plays the new therapist, aided by Zeta-Jones, the veteran therapist. What ensues is a rabbit hole of a case involving back-stabbing (literally), secret keeping and ridiculous foolery that keeps you guessing until the end. You’d think that after a million movies retelling the same kind of stories for the last handful of years that this one would slide easily in line, but it doesn’t. It’s a classic suspense tale that refuses to succumb to the usual suspects of predictability. It’s fast-paced, super mysterious and absolutely chilling. Soderbergh (The Oceans series, Magic Mike, Contagion), who always has something good to tell us about, does a remarkable job of creeping into the minds of these characters just enough to hook us, and then crush our minds when we’re finally let all the way in. As with anything we see him do, it’s creepy, mystical and seriously f’ed up. In other words, we love it.